Maybe you haven't been all out depressed in your life. Then again, maybe you have. Regardless of where you have been or where you find yourself now, there is hope. Any who have been able to escape depression's grasp can testify to the power and faithfulness of God. There is no need to remain mired in depression, and, better yet, it is possible to keep from getting there in the first place. Now I know some people can't relate to depression at all. They just don't understand how some people can get so down on life that they can't even get out of bed. But it all depends on how we are wired. Some people react to stress externally and some people escape internally. Depression is the internal escape, though both means are not Christian. 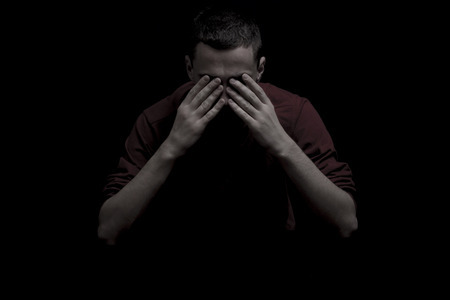 If we haven't had to encounter depression yet, we will likely one way or another. Yes, even church people suffer from depression. We need to have some understanding of it lest we fall into it ourselves or fail to be the difference in helping to bring a loved one out of it. Depression's power may well be that those who are succumbing to it can sense it, but they don't know how to stop it. This causes further concern and speeds up the descent into the dark abyss. Fortunately, depression is not so mysterious. In fact, it is a natural fleshly response to difficulty for many people. We all deal with rejection and hardship in life, some more than others. Failures set us back, suffering wears us down, and temptation prods us day after day. Some give into fleshly indulgence to cope, others lash out in anger and aggression, and others escape into depression. Depression is thus one non christian way of handling stress in life. Like Jonah, we do ourselves no good to run from the issues at hand. We must face the trials and the pain head on by the power of Christ, rejoicing even, in fact. Fortunately, God pursues us in our trials as He did Jonah, even venturing through our valleys with us. There are times when medications are necessary to overcome depression. Our bodies can develop chemical imbalances that God has graciously provided medicine to resolve. But sometimes things aren't this simple. We can take a drug to dull our pain and be dependent on a drug for the rest of our lives, or we can deal with the spiritual realities facing our hearts. I believe that depression stems from a preoccupation with self. There may be triggers of rejection, anger, bitterness, grief, loss, and so on, but these don't necessarily lead to depression even in people prone to it. It is when we don't trust God, when we doubt His love, when we question His character, when we challenge His justice, and when we dwell on ourselves, our situation, our circumstances, and our misfortunes. The road to escape from depression is away from self and toward God and others. Depression may well be a pity party with self as the only participant. This can be difficult because sometimes we don't realize that we are self-consumed when we really are. It can be as subtle as thinking about why God doesn't answer our prayers, bless us, help us, give something to us, or so on, when we ought to be dwelling on Christ. Isaias (Isaiah) 26:3 says, "thou wilt keep peace: peace, because we have hoped in thee." Rather than thinking about Christ and our eternal hope , we begin thinking about ourselves and our situation. "Wherefore having the loins of your mind girt up, being sober, trust perfectly in the grace which is offered you in the revelation of Jesus Christ,"(1 Peter 1:13). Rather than anxiously analyzing, reflecting, and pondering our "hopeless" present, painful past, and overwhelming future, we ought to thankfully give our requests to God in prayer and supplication , forgetting what is behind and pressing on toward the upward call of Christ. But one thing I do: forgetting the things that are behind, and stretching forth myself to those that are before,(Philippians 3:13). We need to let Him carry the burdens that we were never meant to carry. Trying to fix things in our own power and solving our dilemmas in our own strength is doomed to lead to defeat and, for some, eventual depression. We must fix our minds on Christ and what is good, right, noble, pure, and so on. We must be thinking of others welfare ahead of our own even if they seem to be having it much easier than we do. We must think of God rather than ourselves so we don't commit idolatry of self. If we do this, we can be assured...the peace of God, which surpasseth all understanding, (will) keep your hearts and minds in Christ Jesus. (Philippians 4:7). Victory through Christ is our promise. So when we feel the walls closing in and life begins to overwhelm us, we must accept that we can become perplexed, but we must not despair. We may be clueless as to what is going on and totally at a loss as to what to do, but we must not curse God and turn to self. We cannot get to the point of despair. Despair is an accusation against a holy God that He is unjust and unfair, for it means that we believe that He is not worthy of our hope and trust. Christians need not despair because our God cares for us. He may allow difficulty, but it is because He cares. He may not answer our prayers how we want, but it is because He knows better. He may bless somebody else more than us, but only because He loves us and has specific good and perfect gifts for us. So how do we avoid depression? We get the spotlight off of us, we do what we don't want to do, we believe what we don't want to believe, and we love even when we don't want to love. We give what we don't have to give, we trust when we don't have the faith, and we hope against all hope in the same way that Abraham did. Who against hope believed in hope; (Romans 4:18). Our God is faithful and our portion for each day, The Lord is my portion, said my soul: therefore will I wait for him. (Lamentations 3:24). Even when we are faithless, God is faithful, If we believe not, he continueth faithful, he can not deny himself. (2 Timothy 2:13). This is our hope. If we find ourselves in depression, we must ask ourselves if we have lost faith. We must confess and repent of any doubt, mistrust, resentment, self-preoccupation, or other sin. We must believe that God will bring us through because He loves us and because He is faithful. Even if circumstances confine us to our bed, we can still have joy. Let us not let circumstances steal what only God can provide and what is rightfully ours as children of the Lord. When we feel our feet sinking and our strength failing us, may we let (Psalm 39:2-4 Douay Rheims)be our comfort: "With expectation I have waited for the Lord, and he was attentive to me. And he heard my prayers, and brought me out of the pit of misery and the mire of dregs. And he set my feet upon a rock, and directed my steps. And he put a new canticle into my mouth, a song to our God "